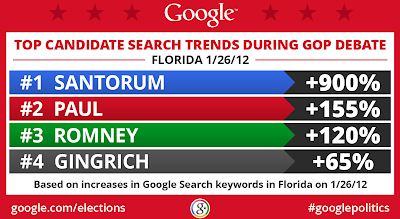 Politics & Elections Blog: Who and what were Floridians searching for during last night's debate? 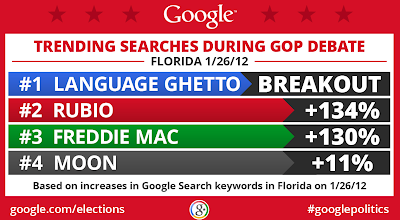 Who and what were Floridians searching for during last night's debate? , Florida for what was the last Presidential debate until February 22. With the Florida primary just days away and Mitt Romney and Newt Gingrich neck and neck in the polls, the candidates sparred on a diverse list of topics, ranging from Romney and Gingrich’s ties to Freddie Mac and Fannie Mae to whether the US should establish a colony on the moon. We at Google Politics & Elections closely monitored Florida search trends to determine which candidates and issues experienced a rise in search interest. 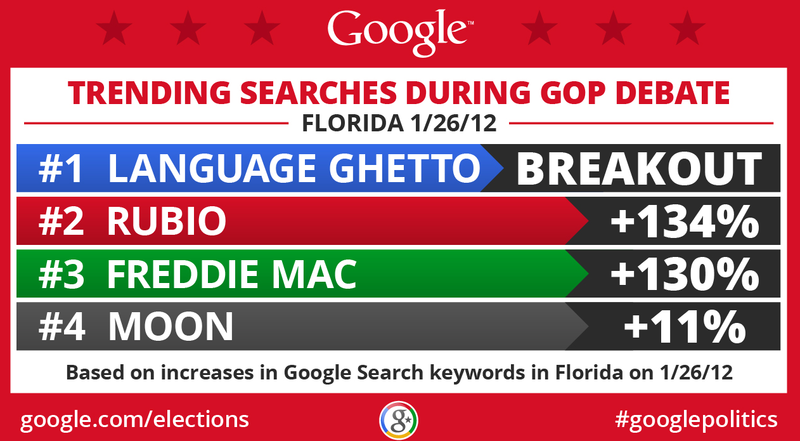 In the first graphic below, we noted which search terms surged during the debate. 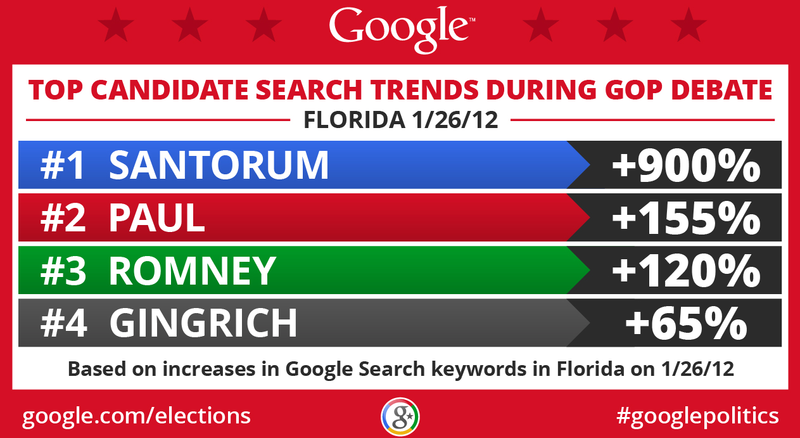 The second graphic displays which candidates experienced the strongest increase in searches over the course of the event. Last night, the four remaining GOP candidates took the stage in Jacksonville, Florida for what was the last Presidential debate until February 22. With the Florida primary just days away and Mitt Romney and Newt Gingrich neck and neck in the polls, the candidates sparred on a diverse list of topics, ranging from Romney and Gingrich’s ties to Freddie Mac and Fannie Mae to whether the US should establish a colony on the moon. Wanna read an interesting guide about term paper writing? have a peek here and you will find your balance!